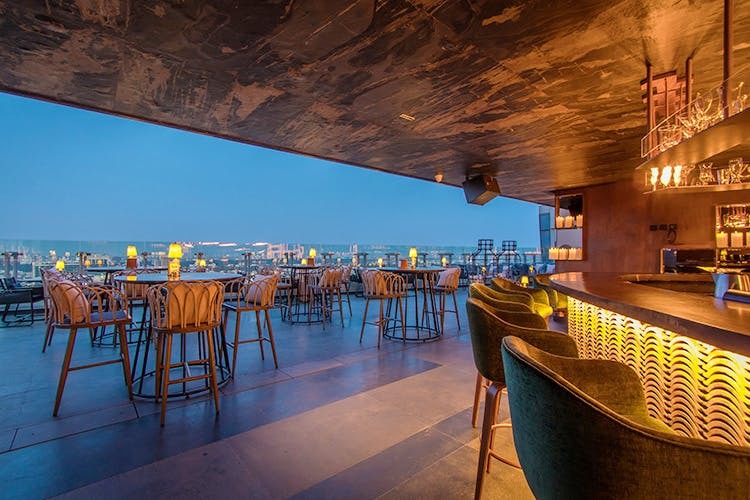 A perfect rooftop setting, with the whole city as your backdrop, Kaze is Residency Road’s newest resto bar with fun cocktails, and a soon-to-open microbrewery. Plus, there’s oysters, sushi and New Zealand lamb chops involved too. Located on the 21st floor of a swanky building right opposite Bangalore Club (the Lavelle Road side), you know what you are getting into as soon as you take the elevator. Because Kaze (meaning wind in Japanese) the latest night spot, microbrewery and resto bar in town is set on a rooftop, complete with helipad. The space is huge with plenty of open air seating in the form of cosy cane furniture, loungy sofas and even tall bar-like seating. The seating may not be suitable in this heat, during the day, but evenings might be breezy and lovely, thanks to the daily rains. There is a dedicated section with a bar and a microbrewery (the brewing tanks are located one floor below) and and the open space leads to an AC section thankfully (if you want to go during the day) with community-style seating and big glass windows. They do have a few tables ideal for four. But wait, have we mentioned the view the yet? Because the biggest reason you need to hit Kaze is actually the view. Never before have we seen the Vidhana Soudha, UB City, and the Kanteerava stadium with the stately Bangalore Club all packed into one view with loads of greenery too. And as grand as it is during the day, it’s magical at night with the skyline all lit up. We settled down into the cool AC section and tried out sharing plates of what Kaze has to offer on the food and drink front. You will find a lot of South East Asian and Japanese influences in the food. First up was the Pork Belly with Raw Papaya Salad. While the salad was fresh, crunchy and spicy, the pork belly was the perfect accompaniment with its juicy, saucy and melty nature. Vegetarians, we would recommend you try the Kyoto Mushrooms with Japanese shrooms stir fried with sake infused butter. This was accompanied by a lovely green chilli (those used to make bhajjis) stuffed with cheese and Sichuan sauce. We also sipped on two good looking cocktails (they deserve Insta stories guys!). The Days Of Sakura, a vodka, triple sec, strawberry, lime, hibiscus, sake, ginger and cucumber number came topped with tropical flowers, mint, fresh strawberries and a candied dried orange in a brass pineapple shaped glass. The cocktail was refreshing and packed in a sweet punch. The Three Minutes Of Thyme, a mix of gin, sake Chamomile flowers, bergamot, Asian ginger ginseng blend and fresh thyme, came done up with several elements. Set on a grassy base complete with flowers and pebbles and a mini lamp for company. We found the cocktail a bit heavy handed on the ginger front. Next up were garlic-rubbed New Zealand lamb chops with salt and pepper (tender and juicy, apparently cooked Nordic style), and oyster tempura with lemon citrus cream and soy bean crumb (with a lovely crunch and a must try). Follow this up with the excellent Hotate Ebi Kudamobo — seared scallop with pineapple and batter fried prawn with watermelon, all skewered together. Sushi fiends, you will be spoiled for choice here (four pages of sushi, sashimi to be picked from) for vegetarian (from cheesy maki rolls to fried tofu and asparagus) and non vegetarian (sushi, sashimi with everything from yellow tailed tuna to eel and octopus to flying fish roe). We are especially going back for the Tsukiji Maki (black rice, prawn, Sri Lankan crab sticks, spring onions and tempura flakes). Not into sushi? Then pick from a basket of dim sum, gyoza and baozi (vegetarian and non vegetarian). For mains, you can try the absolutely stunning Pan Roasted Chicken with edamame ragout or the six hour miso marinated and grilled Black Cod. Finally end your meal with the very trendy and Instagram favourite Tokyo Cheesecake. Ours didn’t really wobble that much though. Just for a meal for two minus drinks might set you back by atleast INR 2,500 to INR 3,000. So book yourself a spot here when you are in a mood to celebrate and ready to splurge or on a date to impress. And the view will make up for all that dent in their wallet. We are waiting for their microbrewery to open up soon too, post elections.